Please join us Friday for a Family Shabbat Service led by our Religious School Students and join us at the URJ Eastern MA and RI Community Shabbaton on Saturday. Our Shabbat service will be led (mostly) by our Religious School students, and will include music and a story. All are welcome to this abbreviated and engaging service, followed immediately (around 7:15) by a pizza dinner. Rabbi Sparr will be available for office hours ​in the afternoon on ​Thursday and Friday by appointment. Other times can also be scheduled. Kindly contact her to do so. Thursday, March 23, 7:00 p.m.
All TEMV Members are welcome. Saturday, March 25, 9:00 a.m. – 5:45 p.m.
​Join Rabbi Robin Sparr, along with rabbis, leaders, teachers, and congregants from around our region, for a celebration of Shabbat including study, services, lunch, music, and community. Scholarship funds available through Rabbi Sparr for those unable to afford the $36 fee. Everyone is strongly encouraged to attend. Click for more details or register here. Saturday, April 15, 5 p.m. Important: This is NOT the 2nd night of Passover but the 5th night! Everyone is invited! 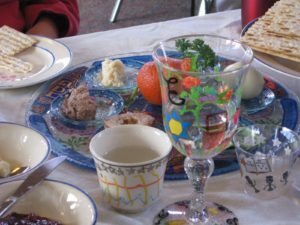 RSVP to Robin Frisch at seder@temv.org. Each family is asked to bring a pair of candle holders, and two food items: main dish, salad, vegetable, or dessert. Please make enough to serve 8 to 10 people, and let us know what you plan to bring when you make your reservation. Members: $3 per person/$10 per family. Join the Mah Jong email list to keep updated about cancellations by emailing mahjongg-join@temv.org.